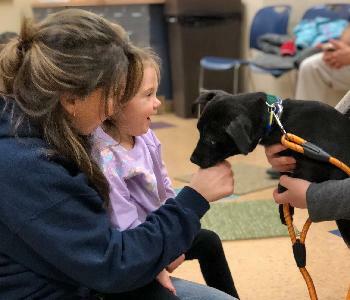 Join us for the Wisconsin Humane Society’s Community Story Time! Story time is for children 2-4 years-old is on the third Thursday of each month from 11:30 a.m. to 12 p.m. Animal-related books with a humane theme will be read at each session and will be followed by activities and an opportunity to meet an animal from the Wisconsin Humane Society. There is a limit of 3 children for each adult. If interested in bringing a daycare or school group, please call 414-431-6159 to make arrangements. There is no fee for this event, but please bring an item from the Wisconsin Humane Society's Wish List to help the animals. Please call (414)431-6159 if you have any questions. Time: 11:30 a.m. - 12:00 p.m.